Matthew B. Sonagere, D.O., has joined Sunnyview Rehabilitation Hospital, an affiliate of St. Peter’s Health Partners. Board-eligible in physical medicine and rehabilitation, Dr. Sonagere will practice physiatry. 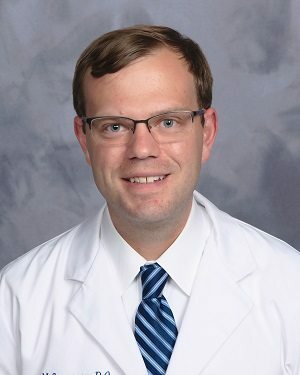 His professional interests include brain injury rehabilitation, post stroke rehabilitation, recovery from spinal and orthopedic injuries, and post-amputation rehabilitation. Dr. Sonagere also performs electrodiagnostic tests such as Electromyograms (EMG) and Nerve Conduction Studies. Dr. Sonagere received his medical degree from the University of New England College of Osteopathic Medicine in Biddeford, Maine, and his bachelor’s degree in neuroscience from St. Lawrence University in Canton, New York. Dr. Sonagere completed a residency at Thomas Jefferson University Hospital in Philadelphia, where he served as academic chief resident. For more information or for referrals to Dr. Sonagere, please call 518-382-4560. Founded in 1928 and located in Schenectady, New York, Sunnyview Rehabilitation Hospital is a 115-bed hospital specializing in physical rehabilitation. Sunnyview provides quality inpatient and outpatient care to patients with a range of conditions including stroke recovery, traumatic brain or spinal cord injury, and disabling illness. Sunnyview’s Neuro-Rehab Institute is a nationally recognized center of excellence of neurological rehabilitation.